We’d love your help. Let us know what’s wrong with this preview of Raven Flight by Juliet Marillier. Now she faces a perilous journey with the rebel Tali and the Good Folk, who shadow her steps. She must find the three Guardians who ca Neryn thought she had lost everything and could trust no one, not even her mysterious companion, Flint. Now she faces a perilous journey with the rebel Tali and the Good Folk, who shadow her steps. She must find the three Guardians who can teach her how to use her unwieldy gift - one that it is rumoured could amass a powerful army. To ask other readers questions about Raven Flight, please sign up. I really loved Marillier's Sevenwaters series but wasn't overly impressed with Shadowfell, though I liked the romance with Flint. Is this about the same quality as Shadowfell, or better? I wasn’t very impressed with the first installment of this trilogy . . . But I’m a big enough Marillier fan, and I saw enough glimpses of the excellence I’ve come to expect from her that it wasn’t difficult to make myself continue with the series. RAVEN FLIGHT was everything I expected SHADOWFELL to be and then some. Ominous foreshadowings, beautifully imagined Fae creatures (and by “beautifully” I don’t mean pretty—I mean convincingly alien creatures to blow your friggin’ mind), the bittersweet longing of new love kept apart, heartbreaking but necessary truths learned by both the characters and the reader<------THIS is why Juliet Marillier will always have a spot on the bookshelf of my heart. In RAVEN FLIGHT, we get to know some of the characters we’d barely met at the end of SHADOWFELL. There are several types of stock female warrior characters. My first impression of Tali was that she was a female warrior of the hardass I-have-no-time-for-puny-nonwarrior-females-like-you-go-mend-something variety, and honestly, it took some time for that impression to be disproved. When Regan tells Tali she's to guard Neryn on her quest to seek out the Guardians, Tali doesn’t handle it well . . .
She rants. She raves. She pleads. Only then does she comply, but she does not do it gracefully. For the first part of their travels, they barely speak a word to each other (b/c sulking). BUT. Nothing brings people together like conflict (Just ask Harry, Ron, and Hermione). Tali and Neryn are doing their stealthy travel thing when Tali leaves Neryn to fish or scout or something. So Neryn’s just chillin’ behind some scrub when she hears their predetermined warning signal, but instead of taking off on her own like she’s supposed to, she decides to investigate. And a good thing she did, b/c Tali’s in a fight for her life, five-on-one, and she’s good, but nobody’s that good. Except Neryn isn’t as sneaky sneaky as she thinks she is, and pretty quickly she’s caught and used as a hostage against Tali—NOT good. So what does Neryn do? Uses her super Callerness, of course. And what shows up to help? Awesome river creature guy, that’s what. The water rose to my waist. A figure rose with it, taller than a tall man, a being all ripples and eddies and swirls, its features discernible as darker patches in the watery substance of its face. Flotsam adhered to its head, forming what might be hair or a hat, and within its body twigs and leaves washed about as if carried on the natural flow of the river. In its liquid face a mouth opened, a great dark cavity, and one of the men let out a terrified oath. But as fantastic as the description of this creature was, Marillier goes further to create a personality, an entity, with complex patterns of behavior. “Wait, please,” I said, my teeth chattering . . .
Coolest flippin’ Fae creature I’ve encountered in recent memory. And while this one is my favorite, it is only one of many. So yeah . . . hard not to bond after that. And then there’s the whole star-crossed lovers thing. You already know that I LOVE Flint. Well . . . so does Neryn. But they can’t be together, b/c . . . they just can’t. Not telling. But their love is so pure and so sweet and so absolutely delicious, that you can’t be upset about the lack of Flint in this installment, b/c the LONGING has taken hold of you, and you refuse to let it go. You cling to it, roll around in it, braid it into your hair and dance with it, and threaten anything that challenges it with torches and pitchforks. Almost as fantastic as the LONGING, is the insight we get into Tali (I knew it, I KNEW IT). When Neryn encounters the warrior ghosts for the second time, Tali is with her. Tali, being a warrior, herself, is of course going to be affected by the meeting. But it’s more than that, and, no, I can’t tell you why, just trust me—it is. I did, however, have a couple of small issues. That thing that I knew about Tali? I’m pretty sure you’d figure it out too. It was kind of obvious in that the-lady-doth-protest-too-much way, but not only did Neryn not figure it out, she consciously states that she had no clue. None whatsoever. My second (and bigger) issue, is that a fairly important character was killed off page. I hate that. I don’t care if someone saw his head on a pike, if I don’t know, irrefutably, that a character is dead, I can’t let go. I keep expecting it to be a mistake, a misunderstanding, a LIE, and they’re going to turn up again any page now. And that . . . is emotionally exhausting. And I’m already emotionally exhausted, b/c you killed someone important. So just stop it. THANKS. But overall, RAVEN FLIGHT was an excellent book. So excellent that I have no qualms about making many friends and family members suffer through the first less-than-stellar installment to get to this one. If you still aren’t completely sold, have no fear—THE CALLER, the final installment of this trilogy will be available September 9. I’m off to read it right now, and I’ll be back to let you know how it goes. Count on it. "Let there be a time in the future, I prayed, when he laughs with his children, and plays on the shore with them, and spends all his nights in loving arms. Let us have that. To whom I was praying I did not know. The future was in our own hands. If we wanted a world where such things were possible, it was for us to make it." I have read a number of sequels this year that have let me down. Second book syndrome, third book syndrome, you name it. Generally, if I like the first book in the series, the subsequent ones will be lacking in some sense. Usually the fault lies within characterization. The first book generally develops the character, and all the development stops as soon as the second book begins. A good plot is always more than welcome, but it takes a hell of a lot more than that to develop a good story. I have been a long-time fan of Juliet Marillier; she has always a masterful storyteller and writer, and I am pleased to say that this book is an excellent continuation of this series. I don't think I need to say much on the quality of her writing; if you have read any of her previous books, you will know that Juliet Marillier's writing is beautiful, evocative, while avoiding the trap of being Dickensianly verbose. Her dialogue is believable, her dialects beautifully done, and written so well that despite their pervasiveness, I have no cause for complaints. Let me digress for a bit while we're on the topic of dialects; in a lot of romance novels involving Irish or Scottish characters, the local dialect is more often than not, intolerable. Laughable. A mockery. They're of the Willie-the-Groundskeeper bent, if you need a little The Simpsons reference in your day. Ach! Ye ken, lassie. Ah, dinna fash yerself, laddie., and so on, and so forth. More often than not, such portrayal of Celtic dialects have me wincing and wondering why the collective countries of Scotland and Ireland do not issue some sort of ultimatum to romance writers everywhere involving the portrayal of their people's speech. "'Guards?' Steep spoke with derision. 'Ye mean them in the ha'? Just for show, they are, save for the Twa. The real fighters, we're a' doon below. We're the strong backbone o' this place; wi'oot the likes o' us, wha'd keep the Southies in check?'" Back to the meat of the book itself. This book is about learning, bravery, sacrifice. About overcoming your own principles and morals for the greater good. About surrending your own short-term wishes and dreams for the chance at a brighter future. About hope, about holding on to that hope when all seems lost. Lest I give the wrong impression about this book because of my high praises, this book is not saccharine sweet. There is no such thing as saccharine sweetness in a Juliet Marillier novel. The events in this book is harsh, unforgiving; life is difficult, people die, friends and strangers alike. There is no such thing as a "safe" character in this series. Beware to whom you get attached, because you might lose them. Still, life goes on, and the living must continue to live and fight and save the mourning for another day. There is no time for mourning, no time for weakness, because the enemy will use that weakness against you, given an iota of a chance. This is not a standalone book, it is very much a continuation of a series, and while there is a small bit of summary of previous events, you will be hopelessly lost if you have not read the first book. In Raven Flight, Neryn continues her life with the rebel, but her training does not last long. As a Caller, her role is bigger than that. She has to seek and summon a number of Guardians, among them the Master of Shadows, the Hag of Isles, the Lord of the North. She has to travel quickly and lightly, so her sole bodyguard and companion is the imminently capable (albeit pricklier than a cactus), Tali. Along the way, they meet old friends, as well as the Good Folk, and encounter plenty of trouble along the way. The pacing is quick, the plot moves quickly and rationally. In other sequels, the action-packed plot still manage to bore me to tears because of the lack of character development. Not so here. The most prominent characters in this book are the traveling companions of Neryn and Tali. Neryn is still weak, still overly soft. She is very human, despite what she has seen, despite what she has suffered, with high morals that bothered me at times. Neryn is powerful, but she is soft. She is reluctant to join the fight, even if she knows that's what is needed to win the war. "It's going to be a long, hard fight, and people are going to die. You should know that, Neryn. What's needed here isn't soft dreams of true love. It’s anger—the anger that drives a person forward. The fury that keeps them fighting right up to the moment the knife goes in. In our world there's no place for love." Her rebel friends constantly remind her that she cannot afford such crises of conscience, that death is a necessity, that her gift is meant to be used, but Neryn is still frustratingly reluctant to use it, because she remembers how her power can kill as well. She has killed before, for the greater good; if she had not done what she did, even more rebel lives would have been lost, but Neryn is so stricken with her guilt that she can hardly bear to use her power of calling on the Good Folk in times of need. "'Still weighed down by conscience? Even though what you did saved both our lives? Neryn, the rebellion depends on your gift. Without you, there's no chance we can do it in the time we have. You need to put these scruples behind you; if you can't, they'll become a burden too heavy for you to carry.'" In the previous book, we met the prickly, antagonistic, permanently angry Tali. I didn't like her very much at first then, but her character is built up so much more in this book. It seemed to be a bad idea to throw Tali and Neryn together at first, and I questioned Regan's decision of assigning her to be Neryn's guard...so did Tali. She has been training Neryn, but in her mind, Neryn is still a weak, incompetent girl, ill-equipped to do what she must do to save them all. Her first impression of Neryn is not a positive one, she thought Neryn was "a wee girl wandering where she didn't belong, trying to do a job that was far too big for her. A girl who hadn't the first idea what kind of life she'd need to live if she became one of Regan's Rebels." Tali is still strong, but she shows her more vulnerable side as we get to know her, and I came to love her as a foil for the oftentimes weak, soft-hearted Neryn. Tali is straightforward, she speaks her mind, she takes no prisoners, there is no bullshitting her. She does not coddle Neryn at all, she cuts Neryn no slack for her physical and mental weakness, and she is exactly what Neryn needs. She became my favorite character in this book. Tali has feelings, she loves deeply, but she knows to keep her emotions under wraps, because that is just hoping for too much. All she can hope for day by day is survival. Anything else is just a pipe dream. "I have no children. I never will. I have no husband, no lover, no family. Only fellow rebels, others like me. All of them understand how it has to be. Hard. Cruel. Brutal. Full of choices like the one Andra had to face. That makes it all the more vital to keep what we do under strict control." Most of this book is Neryn traveling to wake two of the four Guardians who were not considerate enough to live ANYWHERE near each other. There's a lot of walking through pretty landscapes (think Frodo walking across Middle Earth). She does get to see Flint, but the romance was pretty much a side comment. She's mostly building her skills as a Caller to summon the Good Folk in a battle against the evil king (whom Flint is still serving as a double agent). If you like fantasy worlds with a medieval Most of this book is Neryn traveling to wake two of the four Guardians who were not considerate enough to live ANYWHERE near each other. There's a lot of walking through pretty landscapes (think Frodo walking across Middle Earth). She does get to see Flint, but the romance was pretty much a side comment. She's mostly building her skills as a Caller to summon the Good Folk in a battle against the evil king (whom Flint is still serving as a double agent). If you like fantasy worlds with a medieval Celtic feeling, fae, and rebels who live in caves then you'll probably like this story too! The pacing is slow, but everything is so pretty that it never bothered me. There is so much death foreshadowing, and actual death, in this book. I swear to God, if Neryn and Flint don't get their happily ever after after everything they have been through, especially Neryn and all her losses, I'm going to riot. And Flint... Flint is my beautiful cinnamon roll that is too good for this world. And just in general, since Tali normally always takes some sort of leadership role in this book, I love how strong Juliet Marillier makes her female characters. The only thing I love more is how none of the main male characters have a problem with the women's' strength or leadership, but embrace it and never make it a competition. Hell, they even ask for advice and they never feel like it makes them less of a man. Like, it's never addressed. The equality is just expected. I can't even begin to tell you how rare and refreshing that is to read about. I finished this in one day and I am so thankful that I have The Caller waiting for me. Honestly, I think I should just go buy all of Juliet Marillier back list, because I'm way too addicted to her writing. Like, this story is phenomenal, but the way she writes these characters and builds this world truly puts her in a league all by herself. I'm actually in awe and struggling to come up with cohesive sentences, because I'm so impressed with her and this book. "Não era um chamamento o que a situação exigia, mas sim um ritual! Ou, pelo menos. uma prece: o reconhecimento de que o meu dom dependia do poder de Alban, dos seus lagos, montanhas e florestas, das suas grutas, cumes de colinas e lugares sagrados. A magia de uma Voz residia não nela mesma mas no mundo natural; a Voz tinha que aprender a deixar essa magia fluir através dela." August 2014 Re-read: Just as good as last time. I'm so freaking invested in these characters and this world. Gah! I need the next book! Thank goodness I finally have it. Be warned, spoilers for Shadowfell abound below. Last year I read my very first Juliet Marillier book, Shadowfell. It was one of my favorite books of the year and single-handedly saved the YA genre for me. Immersive, smart, peopled with characters I cared about – it drew me in and kept August 2014 Re-read: Just as good as last time. I'm so freaking invested in these characters and this world. Gah! I need the next book! Thank goodness I finally have it. Last year I read my very first Juliet Marillier book, Shadowfell. It was one of my favorite books of the year and single-handedly saved the YA genre for me. Immersive, smart, peopled with characters I cared about – it drew me in and kept me wanting more. I was more than a little nervous when I picked up Raven Flight; sequels have let me down more often than they’ve impressed me. I ended up loving it even more than the first book in the series, and my excitement for the concluding volume in the trilogy is through the roof! But some things did not change...Courage, for instance. Dedication to a cause. Comradeship. When they were strong and pure, when they came from deep in the bone, those qualities could hold fast against all odds. In Shadowfell Neryn had a goal, just reach the end and all would be alright. She learned a bit differently on her journey, but it was still that singular goal. Raven Flight has Neryn on another journey, this time to hone her craft, learn the skill of a Caller, and be the person who is needed to turn the tide in the war to come against the King. She is still incredibly reluctant to use the gifts that can cause death and injury to those around her, she feels guilt for those she hurts and those that die. That showed, to me, that she’s conscientious. If those that have the power to harm never consider, worry over, or rail against the consequences, I worry about them being in power. As she journeys to the Guardians part of what I saw in her training was the knowledge and learning to be able to instinctively use her gift in ways that do the most good. As the journey once again takes a large part of the story, with no small amount of time spent in her lessons, we’re cut off from the greater group of people within Alban. Neryn travels, mostly, only with Tali - her guard. We get some incredibly important glimpses, small moments that are all the more precious, to us and Neryn, because of their brevity, but for the most part this book is the building of Neryn. I have to say, I appreciated this more than nearly anything in the book. Too often in books I’ve read the woman will have some special gift, powerful and demanding, and then she meets a man and becomes dependent on him for the rest of the story. Not so with Neryn. Her thoughts wander to Flint with regularity, but he’s off doing what he must do while she travels with a woman who soon becomes a friend. I didn’t like Tali much when we first met her. She was brash with little depth, I thought. I was wrong. Tali has layers that haven’t even begun to be shown. She’s steadfast and strong, confident and still slightly vulnerable, loyal and a good friend. Watching the true friendship develop between these two was so incredibly refreshing. Let there be a time in the future, I prayed, when he laughs with his children, and plays on the shore with them, and spends all his nights in loving arms. Let us have that. To whom I was praying I did not know. The future was in our own hands. If we wanted a world where such things were possible, it was for us to make it. Flint, oh Flint. I love your tortured soul more with each and every word. Those small glimpses from your point of view were cherished; over too quickly, but all the more special and important because of it. I can’t get enough of this man that walks on both sides of the war and the sacrifices he has to make. The tenderness in his heart, after all he’s done, is amazing and incredible. My heart breaks for him frequently. I worry about him all the time. Sooner or later his secret will be out, I only hope he’s prepared. The moments between Flint and Neryn were heart-wrenching and oh-so sweet. I need more. In Shadowfell the villain, the King, was little more than a reference. We saw the consequences and actions of his decrees, but none of him. Not so here! We finally get more than a vague reference to the King’s villainy; and it was enough to make me wish I could jump into the book and get rid of him myself! I should talk about the Good Folk for a moment, or their dialect. I am a reader that, generally, hates written dialect. It’s often distracting and hard to read, not to mention often used incorrectly and stereotypically. While the Good Folk do talk in dialect, and a fairly strong one, it’s very nearly phonetic, easy to read, easy to understand, and completely consistent. It adds depth and something more to both the characters and the world that they’ve lived in for so long. This is one of the few books where I really appreciate the dialect added to their speech. There’s not a lot more I can say without spoiling a whole lot of the book, but I will say that even with the slightly slower pace than Shadowfell, this book put me through the emotional wringer. There isn’t a character in the entire rebel force, or of the Good Folk that I’m not attached to, all of them are special and distinct. I said, when I finished, that I wasn’t sure what I was going to do with the long year (or so) wait until Caller, the third and final book in this series, comes out. A friend said: “Oh, that's simple. You start her other books.” Lucky for me I haven’t yet dug into Juliet Marillier’s back-list. But I shall, oh yes, I will. I hope you don't mind me addressing you like this. I have been reding your books for more than ten years, so I feel like we have this kind of bond. Not quite like friends, something that can only exist between the writer and his/hers readers. So, my dear Juliet, I have to ask you: what was this?! I still remember a time when your books told breath-taking, adventurous, stories, with female characters full of courage, ready to sacrifice themselves for their families and their beliefs. I still remember devouring The Sevenwaters trilogy (when it was still a trilogy) and feeling swept away. That was some awesome fantasy! Then, of course, I had to read the Saga of the Light Isles, and I was sorry that the Bridei Chronicles were just a trilogy. Because I liked them that much! Even those two books, 'Wildwood Dancing' and 'Cybele's Secret', were really cool. And they were for young readers. Then there was a decline. Come on, 'Heart's Blood' was nice, but nothing particularly great. And from the last three Sevenwaters books outside the trilogy, only 'Flame of Sevenwaters' seemed to have returned to old-time splendour. This Shadowfell Series is disappointing me as I go on reading each book. The first one was ok, but this one was too boring. I can't bring myself to like Neryn, and her relationship with Flint is just eye-rolling. For me, the best about this Series is the Good Folk. They are the best characters you could have come across for these books. Maybe, Juliet my darling, you should have though of writing a series with otherworldly characters only. No complicated and lame human relationships. Just quirky and mysterious creatures going on, maybe, a great adventure. But not all was bad in this book. It was very interesting to see more of Keldec, especially his relationship with Queen Varda. Who rules who? Everyone says that it is the King who's afraid of gifted subjects. But that Queen is clearly a very disturbed (and disturbing) woman. Apart from this, and the presence of those funny Good Folk creatures, I can't point out more positive things. It was boring and very uninteresting. I don't think I will be reading the third book, 'The Caller'. I usually like to finish a series, since I started it, but it is high time that I stop doing that. It is enough that I finish the book. Besides, I don't feel like wasting money on something that's probably be a disappointment. All this said, I must ask you if I should read 'Dreamer's Pool' from the new series. I am always curious about your books, Juliet, but I don't want to end up feeling disappointed as I had these past books. And trust me when I tell you that I waited a lot to be able to put my hands on Shadowfell. So, I think I said what I had to say. Not all nice, but I firmly believe that some things are best not left unsaid. And I hope you keep on writing. I also hope I will read another great book from you in the future. Because I know you can. You have it inside of you. [3.5 stars] Raven Flight follows Neryn and Tali as they venture across Alban to seek out the elusive Guardians that are essential in Neryn's training as a Caller. The unlikely duo are opposites, but both are admirable in their own right. Neryn has a sort of quiet strength about her, she never complains or whines when things get tough. Tali on the other hand is tough and outspoken. They are the epitome of strong female characters, and the blossoming friendship between the pair is beautiful. Howeve [3.5 stars] Raven Flight follows Neryn and Tali as they venture across Alban to seek out the elusive Guardians that are essential in Neryn's training as a Caller. The unlikely duo are opposites, but both are admirable in their own right. Neryn has a sort of quiet strength about her, she never complains or whines when things get tough. Tali on the other hand is tough and outspoken. They are the epitome of strong female characters, and the blossoming friendship between the pair is beautiful. However, having said all that I have to admit that I didn't really enjoy Raven Flight as much as I had hoped to. It was a slow-paced sequel, and I often found myself skimming over the descriptions. I didn't mind that the pacing of the first book was slow, but usually from a sequel I expect action. Flint and Neryn both have separate duties that weigh heavily on them, and so conflict arises in their relationship. The two tread very different paths - as the Kings most trusted Enforcer Flint has to do what he can to avoid arousing suspicion and prove that he's loyal. Neryn on the other hand must travel across Alban to seek out the Guardians, while at the same time avoid being captured by the Enforcers. Being together is dangerous as they can be used against each other, and this of course cannot happen as they both play an important role in freeing Alban from the grips of the King. Although they are apart for most of the book, Flint and Neryn do share some sweet moments when they briefly meet. It was towards the end where things really started to picked up, and I became truly engaged. The last quarter of the book really packed a punch, and I hope that this sudden appearance of heart stopping revelations and excitement carries over to book 3. Despite not loving Raven Flight as much as Shadowfell I will still be picking up the final book in the trilogy when it's released. OH MY GOD.... IT HAS A COVER!!!! PS: The world cannot end today 'cause I still need this book! If I was disappointed in the first installment of Shadowfell, I can no longer say it wa There is a long winter to be spent at Shadowfell for Neryn to figure out who she will be to the people there and their rebellion. A long winter to become something more than the waif of a girl she arrived as and bring the Good Folk to Regan’s cause. A long winter followed by a very short few seasons in which Neryn must travel to the far reaches of her land to gain the training necessary to succeed as a Caller. Raven Flight was a disappointment, there was minimum action, the plot was very-slow paced and unnecessarily repetitive, there was too much telling and little showing, serious issues were being resolved too easily, and Neryn’s training was a farce. Neryn wasn’t a strong enough character with exciting enough adventures to carry this book on her own. She is in constant need of help and carrying, her overwhelming angst over killing was annoying and hypocritical, she’s joined the rebellion for God's Raven Flight was a disappointment, there was minimum action, the plot was very-slow paced and unnecessarily repetitive, there was too much telling and little showing, serious issues were being resolved too easily, and Neryn’s training was a farce. Neryn wasn’t a strong enough character with exciting enough adventures to carry this book on her own. She is in constant need of help and carrying, her overwhelming angst over killing was annoying and hypocritical, she’s joined the rebellion for God's sake, and her achievements failed to impress me. Neryn is more of a Mary Sue in this book; she is the center of the story's universe because the author tells us so through the subsidiary characters cheering ordinary or even stupid actions. Since book one I’d hoped we’d get to spend more time with Flint and Raven Flight’s blurb seemed to suggest we'd get more from his point-of-view, but even though that happens, it can't be for more than 20 pages total, which is a shame! Flint is such a deep and complex character with such potential for character and plot development. Experiencing events from his point-of-view would be both exhilarating and informative. It would give the reader a chance to experience events from the perspective of the King’s and his followers and a front-row seat to Flint’s dangerous life as a spy. This is an incredible book. I have no words but those to say. Juliet Marillier always entertains, evokes emotion and delights her readers. There is no second book woes here. In fact, I think I like this one better than the first one. The first one built a perfectly wonderful world, but Raven Flight added so much more to the world. I have been raving to anyone who will listen about this author since I picked up Daughter of the Forest by accident at the library. I very rarely make purchases of boo This is an incredible book. I have no words but those to say. Juliet Marillier always entertains, evokes emotion and delights her readers. There is no second book woes here. In fact, I think I like this one better than the first one. The first one built a perfectly wonderful world, but Raven Flight added so much more to the world. I have been raving to anyone who will listen about this author since I picked up Daughter of the Forest by accident at the library. I very rarely make purchases of books on the release day, but Marillier's books are one of the exceptions. She continually works her magic with her amazing world building and incredible characters. My only complaint is that there is too much of the journey motif in both books. I was glad when (view spoiler)[ Whisper magically transports them to the Lord of the North (hide spoiler)]. And she makes you think. What are the consequences in war? How responsible are the leaders when sending troops into battle? Neryn wrestles with this. I love how Marillier has depicted her journey as she tries to answer these questions. A escrita da Juliet continua maravilhosa, mas só nas últimas 140 páginas conseguiu agarrar-me a sério. O facto de Flint quase não aparecer neste livro foi uma questão importante, pois é a personagem mais interessante desta história. Juliet's writing is always wonderful but this book only grabbed me in the last 140 pages. That Flint was almost absent was an important issue, as he's the most interesting character in this story. 3.5 stars. I love Juliet Marillier, and have read all her books. I appreciate how she writes fantasy, but includes real issues and real emotions. I also like the fact that she always creates strong female characters, unlike many other fantasy books. Although I really enjoyed this book, I thought it was not as strong as the first in the series. I can't wait for the final installment coming early 2014.
по-прежнему не уверена, могу ли я ее рекомендовать - очень уж не our usual stuff, но такое удовольствие получаю. Recordo bem que para mim, que nunca tinha tido o prazer de ler Juliet Marillier, Shadowfell foi como o abrir de uma janela para um novo mundo, um mundo onde reinava a beleza da simplicidade, onde a bondade se encontrava a florescer timidamente mas com raízes fortes entre o mal e onde a partilha era exposta como lição primordial, numa terra consumida, mirrada pelo egoísmo do seu rei. Agora, finda a leitura de O Voo do Corvo e após ter tido a oportunidade de conversar com a autora, a sua história Recordo bem que para mim, que nunca tinha tido o prazer de ler Juliet Marillier, Shadowfell foi como o abrir de uma janela para um novo mundo, um mundo onde reinava a beleza da simplicidade, onde a bondade se encontrava a florescer timidamente mas com raízes fortes entre o mal e onde a partilha era exposta como lição primordial, numa terra consumida, mirrada pelo egoísmo do seu rei. Agora, finda a leitura de O Voo do Corvo e após ter tido a oportunidade de conversar com a autora, a sua história e os desígnios dos seus intervenientes alcançaram uma nova consistência, uma nova dimensão em que a aprendizagem ficcional se mescla com o real de forma palpável, através de uma aventura épica com valores contemporâneos onde a essência da fantasia brota ao longo de todas as páginas. Doravante as minhas palavras pecam por se dirigirem apenas aos leitores que leram o primeiro livro da trilogia da Shadowfell pois, tal como fica claro na sinopse, há o risco de spoilers. Esta narrativa retoma o texto onde terminou o seu antecedente, com chegada de Neryn à fortaleza dos rebeldes que tanto se esforçou para alcançar, Shadowfell. Depois da sua imensa caminhada, repleta de perigos mas também de conhecimento e amadurecimento - em que teve oportunidade de criar laços com os Boa Gente -, a protagonista deste enredo encontra-se agora entre aqueles que procuram banir o verdadeiro mal do Reino de Alban, muitas vezes sacrificando sentimentos em prol da vingança pelas suas perdas irreparáveis, lutando pela Causa que acreditam ser justa aos tempos cruéis em que tentam sobreviver. É certo que passado doloroso jamais será esquecido e que o presente se adivinha mais arriscado que nunca, mas existe uma batalha para organizar da qual dependerá o futuro de todos e todos, por sua vez, dependem das conquistas da Voz. Este é, portanto, um livro em que Neryn terá que dar tudo por tudo encetando mais uma longa jornada rumo à erudição, uma jornada em que não estará só podendo contar com a valorosa companhia de Tali e de muitas criaturas mágicas que seguirão de perto os seus passos. Após um primeiro livro em que tudo era novidade, é tempo de tecer e fortalecer laços, desta feita o leitor fica a conhecer profundamente os anseios do coração de todos os intervenientes da narrativa, sejam eles os Rebeldes, criaturas fantásticas ou até o suserano tirano Keldec, ao longo deste texto que se dedica, em partes iguais, ao desenvolvimento do enredo e às suas inúmeras personagens. No que respeita aos Rebeldes, muitos são aqueles que contribuem para dar a conhecer o dia-a-dia na fortaleza de Shadowfell, deixando subentendidos os seus passados difíceis e, mais importante, permitindo que o leitor descubra os planos futuros de insurgência contra rei. De todos eles, para lá de Flint e Neryn, creio que é relevante destacar Regan, o líder, e Tali a guerreira. Regan é típica voz do povo, sabendo exactamente como cativar, conquistar e a levar a que outros se juntem à sua luta. Justiça e honra são características inatas à sua pessoa, querida por todos e seguida como um exemplo entre os seus. Tali, por sua vez, consegue ser o oposto, representando a necessidade de existir um lado menos emocional no texto. No entanto, a sua bravura, força e astucia são instrumentos poderosos e que fazem de si uma guerreira exemplar, mestra na sua arte, algo crucial e necessário nestes tempos difíceis. Devido à sua viagem com Neryn, ficamos a conhecê-la de uma forma íntima, acabando por ser uma personagem com elevado protagonismo que facilmente conquista quem lê. No que respeita aos Boa Gente nem sei por onde começar. Eu já adorava Salva, Oco e Gorro Vermelho, que revemos durante a leitura, mas fiquei encantada com a diversidade de povos que nos são apresentados – como citei a jornada da protagonista é longa, da Vigia do Sul à Vigia do Norte, e a diferença entre os seres, todos eles peculiares, é uma mais-valia que comprova a criatividade surpreendente e inspiradora de Juliet. A Bruxa das Ilhas, Vigia do Sul, é dos meus seres mágicos favoritos, pela sua ligação ao mar e pelo facto de ter um companheiro bem conhecido do folclore, um selkie, mas também no Norte me apaixonei por personagens como Flow ou os Dois, que representam bem a essência do fantástico. Este não é um texto em que o romance abunde, ou seja, em que esteja presente de forma constante, mas a forma como está representado é enternecedora. A ligação entre Flint e Neryn é realmente muito especial, ainda mais atendendo à distancia física que os separa, pelo que se verifica o florescer dos sentimentos de ambos à par com os desenvolvimentos do enredo em que cada um intervém – o amadurecimento de Neryn e o que acontece no reino pela parte de Flint, que nos permite conhecer brevemente e vil esposa do rei. Este casal é, ainda, marcado pela moralidade e os valores que os acompanham e que são um ponto-chave do livro. Tal como aconteceu anteriormente, e é algo que me parece ser recorrente nas obras desta autora, o leitor pode contar com a abordagem constante a valores pertinentes, entre os quais se destacam a confiança e a paciência necessários para atingir metas heróicas, assim como a bondade, a partilha e a generosidade, características inatas de algumas personagens da narrativa. A heterogeneidade dos cenários, belíssimos, em sintonia com a natureza, tal como tudo resto, são também lugares comuns da autora, pelo que do mar às montanhas, passando por florestas ou característicos povoados, não desiludirão os fãs desta escritora - que atende aos vários elementos e lhes confere um misticismo muito próprio e em concordância com o ambiente em que se desenvolve a acção. Em suma, este livro é tão bom ou melhor que o primeiro e prima por ter todos os ingredientes que satisfarão os adeptos deste género literário. Das lutas à magia, com um toque encantador de romance e intriga, cenários épicos e personagens singulares, fazem de O Voo do Corvo uma escolha assertiva para os fãs de fantasia. Muito já foi dito sobre Juliet Marillier. Ela é a autora mais amada da Fantasia e os seus livros apaixonam todos aqueles que têm a honra, o prazer de os ler. Um séquito imenso de fãs segue-a desde a publicação de A Filha da Floresta, e todos os seus livros, sem excepção, provocam sentimentos nos seus leitores, sejam bons ou maus, mais intensos ou menos. Se as coisas têm andado mais agrestes com a publicação dos últimos três livros de Sevenwaters, a verdade é que uma nova série, uma nova história, tem voltado a agarrar os seus leitores senão da mesma forma, pelo menos de uma forma muito própria, demonstrando o seu mérito, o seu brilho. Shadowfell virou a maré e encheu os corações com a sua história de Bem e Mal, de criaturas fantásticas, de heroínas predestinadas, de amores condenados que refulgem contra tudo e todos e, agora, a sua continuação chega para nos continuar a contar a história de uma das protagonistas mais fortes do Mundo Marilliano. O Voo do Corvo foi publicado no primeiro dia deste ano e já está traduzido para a nossa língua e para holandês. Apaixonei-me por Shadowfell logo na primeira página. Fui transportada para dentro da sua história com uma intensidade que só os livros de Marillier conseguem. Senti na pele todas as dores, as alegrias, as dúvidas das suas personagens e, um ano depois, todas estas sensações voltaram a dominar-me enquanto me perdia na leitura de O Voo do Corvo. Voltar a rever este mundo, fez-me apaixonar por ele outra vez, com mais intensidade, com mais dedicação e isso deve-se muito à voz única de Juliet. Já lhe chamei bardo dos tempos antigos em muitas outras opiniões e volto a fazê-lo, porque a sua escrita é mágica, a sua forma de contar uma história única e avassaladora, a sua voz é inigualável. Ler um livro seu é um doce tormento, é perdermo-nos nas palavras e sermos conquistados uma e outra vez com um sorriso nos lábios. Como todas as histórias de Juliet, também esta é um eco das histórias de embalar contadas por tempos imemoráveis, destinadas a encantar e a ensinar, cheias de mensagens de coragem e bondade, de verdade e companheirismo, de amor e tormento, histórias que nos fazem sonhar enquanto a dura realidade nos coloca à prova. Ao longo deste livro vamos encontrar tudo isto e muito mais num enredo cheio de lições e obstáculos, perdas e pequenas alegrias, que nos vai agarrar na primeira palavra e deixar-nos a desejar ter o próximo livro já à mão na última. Como qualquer história de assim ser digna de ser chamada, esta tem uma demanda que irá colocar as forças do Bem contra as do Mal brevemente mas, para isso, é preciso aprender, é preciso crescer, é preciso encontrar a força e a coragem que só os heróis têm. Por vezes doce, por vezes cruel, esta é uma história maravilhosa, cheia de criaturas fantásticas, lendas vivas, duras aprendizagens e amores condenados, que se vai desenrolando frente aos nossos olhos de uma forma apaixonante e encantadora onde o mal não pode ser evitado mas torna as convicções ainda mais fortes, mais ardentes, mais desejosas de um final feliz. Ao longo dos vários acontecimentos deste livro há duas forças que se degladiam momento a momento, através de actos e palavras. Estes dois sentimentos tão opostos estão presentes ao longo de toda a narrativa e cimentam toda a história. A esperança é uma luz por vezes forte, outras vezes quase apagada, que vive na coragem, na amizade, nas recordações, nos sonhos daqueles que lutam por uma vida melhor. Mas o desespero também está sempre lá, na impotência, na incompreensão, nas perdas por um bem maior. Há um equilíbrio sempre presente, um equilíbrio necessário não só na Natureza como nos actos humanos que tornam esta história tanto senhora de boas memórias como de lágrimas abundantes. Somos atormentados em vários momentos de perda e quase derrota, naquele final inesperado. Atormentados numa miríade de situações que nos colocam o coração na boca mas, também há momentos em que somos adoçados, em que tudo parece melhor nem que seja fugazmente, em que nos sentimos capazes de acreditar em tudo. Com laivos de tempos antigos, de tradição e magia, O Voo do Corvo vai buscar os temas habituais de uma história marilliana mas dá-lhe uma alma própria, a alma dos heróis de Shadowfell, um grupo único de personagens pelos quais é impossível não sentirmos um grande carinho. Neryn cresceu neste livro, mais, mostra-se mais sábia, mais adulta, mais forte até, conseguindo cativar-nos, conseguindo mostrar que afinal pudera estar à altura do que se espera dela. Acompanhá-la na sua demanda faz com que apreciemos mais, principalmente quando percebemos que o seu modo desconfiado e fugidio já lá vai. Mas Flint continua a ser a personagem adorada nesta história mesmo que não apareça tanto. De cada vez que ele aparece apenas faz com que o leitor o adore mais e mais. Contudo, a grande surpresa deste livro foi Talli, a preciosa guerreira que se vai mostrando ao longo da história e que nos toca o coração em vários momentos, principalmente quando nos faz lembrar uma das minhas personagens mais queridas de Sevenwaters, Ciarán. Raven Flight is the second in Juliet Marillier's Shadowfell trilogy. In book one, Neryn discovered she was a Caller, one who possesses the gifts to call the Good Folk forward to fight on the side of the humans. It was a rough go for Neryn. She didn't know who to trust or even if she wanted to be the Caller. In Raven Flight Neryn has come to terms with her role as the Caller and it's now time for her to hone her gifts. She's used her ability in the past, but her lack of training makes her a danger Raven Flight is the second in Juliet Marillier's Shadowfell trilogy. In book one, Neryn discovered she was a Caller, one who possesses the gifts to call the Good Folk forward to fight on the side of the humans. It was a rough go for Neryn. She didn't know who to trust or even if she wanted to be the Caller. In Raven Flight Neryn has come to terms with her role as the Caller and it's now time for her to hone her gifts. She's used her ability in the past, but her lack of training makes her a danger to those around her. To learn more about her abilities Neryn will need to go on a journey and learn from the four Guardians. The journey is long and time is running short. Raven Flight is your typical middle trilogy book. Quite frankly there's not a lot going on here. Once again there is a lot of traveling as Neryn goes to search for the Guardians that can teach her how to harness her abilities. A lot of time is spent on Neryn learning about her capabilities as well as her role in the larger conflict. Neryn has to come to terms with the fact that she is going to hurt and ultimately kill people with her gift, and this is a struggle for her, but a necessary lesson. What I liked about Raven Flight is that readers get to learn more about other characters in the rebellion. In particular, Neryn is escorted on her journey by the belligerent Tali. Tali is not happy about accompanying Neryn. She is the right-hand to the leader of the rebellion and she does not want to leave him unprotected. But orders are orders, so Tali protects Neryn throughout their journey. I liked seeing more of Tali as I think she represents another element of the rebellion. She is completely focused on the ultimate goal of getting rid of the tyrant, King Keldec. Tali doesn't believe in making connections with others and she is not shy about sharing her disapproval of Neryn's relationship with Flint. In Tali's mind, there's no point in having relationships with other people; many are likely to die. However, Tali learns a hard lesson about this when someone close to her dies without knowing how she feels about them. What's the point of fighting for a future if you have no hope for it? I really liked Tali as a character. She's strong, as are her opinions, but I find her a really interesting character and I hope that she continues to have a major presence in book three. What I was less enthused about in Raven Flight was the romance. Ugh. Not a fan of it at all. In Shadowfell Neryn found herself reluctantly forming a friendship with Flint, a double agent for the rebellion. There was a lot of back and forth between them, but suddenly in Raven Flight they're all in love and what not. Quite simply, I just don't buy it. These two barely spend any time together and now they have all these deep emotions. Personally, I thought that they came out of no where considering there is very little interaction between them in Raven Flight. The romance came off as insta-love, which is not my favourite element in young adult novels. A little more development with this plot would have went a long way in making this relationship a stronger one. I also struggled with the pacing in Raven Flight. I had a hard time getting through this one. There was just so much traveling and pauses for Neryn to learn. The pacing was so start-and-stop it was hard to motivate myself to read through to the end. Paradoxically, it was the end that changed my opinion on Raven Flight. The novel ends full of action and heartbreak, I was left desperately wanting to read the final installment. I am hoping that the pacing of the final book will be a little more even since the slow build up to conflict is clearly not my preferred style of plot. Ultimately, Raven Flight did an adequate job of continuing the story of Shadowfell. The issues I had with book one, continued into the second book, but much of that has to do with personal reading taste. As much as I'm not found of the meandering pacing, I do want to know how the conflict with the king will be resolved and whether or not Flint and Neryn get their happily ever after. A história de Neryn e Flint começou em Shadowfell e a promessa de que muito ainda estava para acontecer cumpriu-se. O Voo do Corvo, continuação dessa narrativa, é uma obra que não apazigua, pelo contrário, revolve-nos por dentro semeando a ansiedade e a necessidade de avançar sempre cada vez mais na história. Acima de tudo acaba por ser um ponto de paragem obrigatório entre o início e o fim da trama, servindo mais como uma ponte entre o que aconteceu e o que está para vir. Neryn, depois da sua r A história de Neryn e Flint começou em Shadowfell e a promessa de que muito ainda estava para acontecer cumpriu-se. O Voo do Corvo, continuação dessa narrativa, é uma obra que não apazigua, pelo contrário, revolve-nos por dentro semeando a ansiedade e a necessidade de avançar sempre cada vez mais na história. Acima de tudo acaba por ser um ponto de paragem obrigatório entre o início e o fim da trama, servindo mais como uma ponte entre o que aconteceu e o que está para vir. Neryn, depois da sua recuperação, começa finalmente algum treino físico antes de partir à procura do conhecimento que os Guardiães lhe podem fornecer para se tornar na Voz que todos esperam. É Tali quem fica encarregue de a acompanhar e assim partem as duas, rumo a um destino incerto, mas cujos resultados esperados funcionam como força motriz. Para quem iniciou a sua aventura na escrita de Juliet Marillier com o mundo de Sevenwaters, será sempre complicado evitar fazer comparações no que toca às histórias de amor e até à contribuição das personagens femininas. Neryn não é uma personagem tão forte e empática como Liadan ou até Sorcha, nem Flint um Red ou um Bran. Talvez por ser virado para o público jovem-adulto a autora tenha optado por fazer algo mais leve, mas que ainda assim enternece os mais românticos. Gosto da forma como Juliet Marillier continua a aplicar a sua costela druida nas suas obras. Sendo eu uma curiosa pela doutrina druida, agrada-me a conjugação da aprendizagem da Voz com os elementos, a dinâmica do respeito e da manipulação dos mesmos sempre consciente da importância e da ligação à natureza. Cada elemento tem as suas características e a forma como cada um é abordado está original e solene. A narrativa alterna entre boa dose de acção e emoção com alguns momentos mais parados. Ficamos muito tempo sem notícias dos Rebeldes e quando chegam nem sempre é para nos deixar de sorriso no rosto. Não esperem paninhos quentes nem finais totalmente felizes. Adorei o papel de Tali e admiro-a imenso. Também gostava de ver esta história narrada através de Flint, penso que daria uma perspectiva muito interessante e com mais informações sobre o reino de Keldec. As poucas visões que nos são dadas sabem a pouco. In RAVEN FLIGHT, we learn more about what exactly makes Keldec so evil. And boy is the man frightening! In one of the most riveting s RAVEN FLIGHT was not as engaging for me as Shadowfell—but the thing is, they’re not all that different from one another. Neryn is still this can-do-no-wrong protagonist who, if not liked instantly by all she meets, at least can quickly win them over with her earnest naivete. The plot is straightforward quest involving long distances traveled and new characters met. Yeah, so enjoyable to reread this, I'd forgotten about Regan's death, and that Hollow was fine, and yeah, now to read The Caller! Man, oh, man, I loved this book! I wish there'd been more Flint and Neryn time together, but the times that were were in Flint's head! Can't wait for Caller!!! Good, but nothing to write home about. 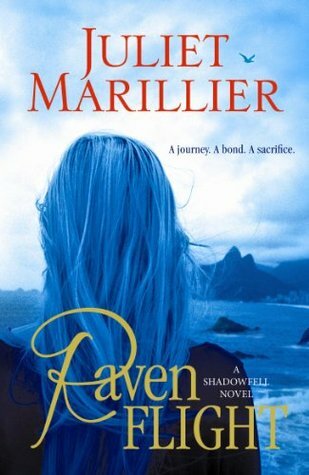 While Raven Flight takes leaps and bounds in terms of Neryn's development it fails to entrance and enthrall the way that Marillier's previous works are so well known for. I've spoken many times about the quiet that Marillier is able to instill within the core of her books. How introversion and introspection breed beautiful landscapes and expressive characters. While that is not exactly missing in this series, Raven Flight is definitely missing some quality Good, but nothing to write home about. While Raven Flight takes leaps and bounds in terms of Neryn's development it fails to entrance and enthrall the way that Marillier's previous works are so well known for. I've spoken many times about the quiet that Marillier is able to instill within the core of her books. How introversion and introspection breed beautiful landscapes and expressive characters. While that is not exactly missing in this series, Raven Flight is definitely missing some quality that compels the reader to push forward. The quality that makes quiet exciting and instead leaves the reader pushing forward, not from enticement, but rather in hopes of reading about something, anything actually happening. Like an event that's not just two women traveling the opposite route that we spent traveling in Shadowfell. I think the reason that this quiet doesn't work so well in the Shadowfell series is because unlike Marillier's other stories, Shadowfell's plot line is based in a problem that requires action. 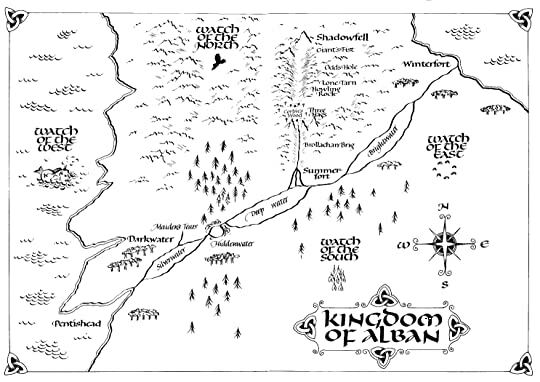 It would be different if this was merely Neryn's story of self discovery, or if mysticism was the main focus, but instead the core of the series is the fight to save Alban from a tyrannical king. And for that to occur there must be a battle. For the first two books we have been traveling, trying to amass an army in order to ultimately fight evil. The plot is physical and therefore the book's structure needs to mirror it in order to draw the reader in. It is hard to read a book leading toward an epic battle without any skirmishes. It is hard to read a book about people and the changes wrought on society with very little character interactions. This is not to say that the story is bad or that there were not parts that I enjoyed, just that it feels imbalanced. And while there were times I was drawn into the story there were just as many times that I read simply in hopes of being done sooner rather than later. I enjoyed Tali and Neryn's relationship. I enjoyed watching what was once begrudging tolerance blossom into an enduring friendship. But for me just as their physical route mimicked the route of book 1, so did the relationship structure mimic Neryn and Flint's previous growth. While the intent of the relationships are different the structure of the two books are so similar it's hard to feel like anything has been gained once we reached the end. That is not to say that things did not happen in Raven Flight. And it is not to say that these moments were not important, but because of the similarity to book 1 they failed to make their mark, to penetrate and create feeling.